Hyōgo Prefecture of Japan is located in the Kansai region with its capital at Kobe. A prefecture is an administrative jurisdiction. 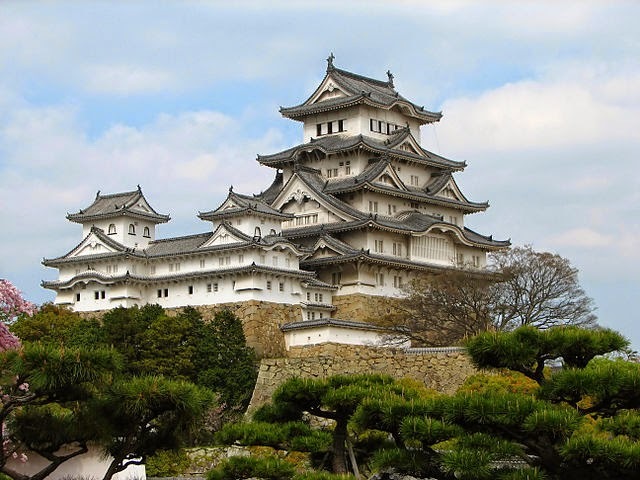 This place is famous for the ‘Himeji Castle’ a hilltop Japanese castle complex located in Himeji, in Hyōgo Prefecture. The castle is regarded as the finest surviving example of prototypical Japanese castle architecture, comprising a network of 83 buildings with advanced defensive systems from the feudal period. Himeji Castle dates back to 1333, when Akamatsu Norimura built a fort on top of Himeyama hill. For over 400 years, Himeji Castle has remained intact, even throughout the extensive bombing of Himeji in World War II, and natural disasters such as the 1995 Great Hanshin earthquake. Himeji Castle is the largest and most visited castle in Japan, and it was registered in 1993 as one of the first UNESCO World Heritage Sites in the country. Himeji the city located in Hyōgo Prefecture in the Kansai region is in news for wrong reasons. 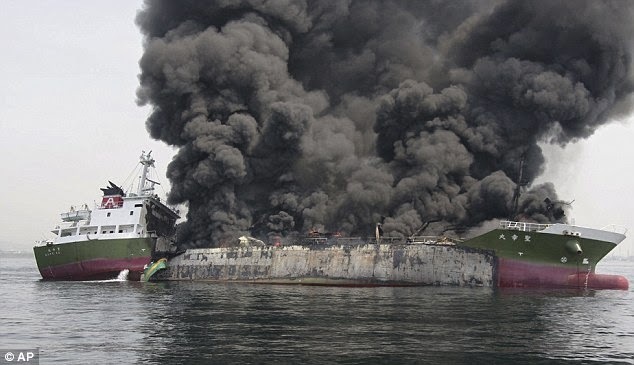 News sites report that a Japanese oil tanker has exploded off the country's south-west coast near Himeji port, leaving one of the eight people aboard missing…….. four others are reported to have sustained serious injuries. According to the country's coast guard, fire gutted the middle of the Shoko Maru – the 998-tonne tanker. Huge custom built tankers have vastly improved the transportation and handling of petroleum products…. At the same breathe – the bulk tankers present some special problems such as the surging and expansion of the liquid cargo. The hazardous nature of crude oil, need for dispersal of flammable vapours have all posed serious safety concerns. Many tankers are equipped with inert gas systems and vapour control systems to minimize fire and explosion risks. But despite the advances that have been made in tanker design, fire prevention systems, and firefighting technology, shipboard fires remain a big threat. The hazard of transporting flammable materials threatens not only the crew but also for the environment in the form of probable oil spills and pollution causing harm to marine life. Human errors have been determined as one of the biggest causes of these accidental losses. The captain of the oil tanker is feared dead; fire is reported to have started when a grinder used to remove paint ignited oil. Daily Mail reports that the tanker burst in to flames 450km west of Japanese capital and plumes of thick smoke were billowing 100 metres into the sky. The ship had just unloaded its cargo at a port near Hyogo prefecture. Emergency crews used hoses to douse the fierce blaze, which started when a spark from a grinder ignited oil on board on Thursday. The fact tanker had just unloaded most of its cargo at a port in the west of the country is good news as otherwise it would have been a bigger inferno with flammable material. According to news, the ship was virtually empty when the accident occurred. News of the incident caused Prime Minister Shinzo Abe to interrupt debate in parliament. 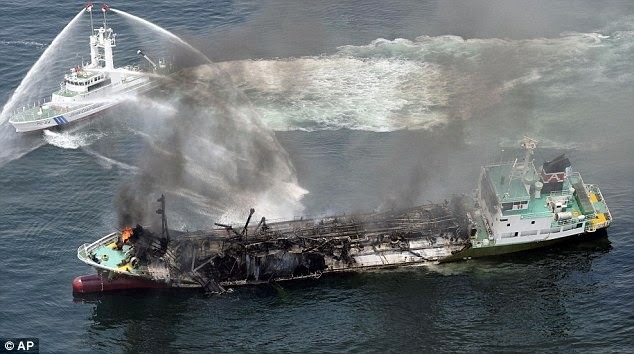 'In waters off Hyogo (prefecture), a tanker has exploded and is currently in flames,' he told lawmakers. Himeji port is one of a number that sit along the Inland Seto Sea coast, where there are numerous pockets of heavy industry. The city itself is a popular tourist destination, and is home to one of Japan's finest feudal castles. Kobe, as it is known today, was founded on April 1, 1889, and was designated on September 1, 1956 by government ordinance. The history of the city is closely tied to that of the Ikuta Shrine, and the name "Kobe" is derived from an archaic name for those who supported the shrine. During World War II, Kobe was bombed in the Doolittle Raid on April 18, 1942 along with Tokyo and a few other cities. Eventually, it was bombed again with incendiary bombs by B-29 bombers on March 17, 1945, causing the death of 8,841 residents and destroying 21% of Kobe's urban area. Following continuous pressure from citizens, in Mar 1975, the Kobe City Council passed an ordinance banning vessels carrying nuclear weapons from Kobe Port. This effectively prevented any U.S. warships from entering the port, policy being not to disclose whether any warship is carrying nuclear weapons. This non-proliferation policy has been termed the "Kobe Formula". On January 17, 1995, an earthquake measuring at 7.2 on the Richter magnitude scale occurred killing 6,434 people and rendering tens of thousands homeless. The earthquake destroyed portions of the Hanshin Expressway, an elevated freeway that dramatically toppled over. The Port of Kobe was Japan's busiest port and one of Asia's top ports until the Great Hanshin Earthquake; Kobe has since dropped to fourth in Japan and forty-ninth busiest container port worldwide (as of 2012).